The UK coworking industry is evolving. Established as hubs of innovation and collaboration, the industry grew up around the needs of small start-up businesses and individual professionals. Increasingly, coworking is being adopted by larger corporate organisations that are either occupying dedicated coworking office spaces or re-creating this kind of environment within their own buildings. 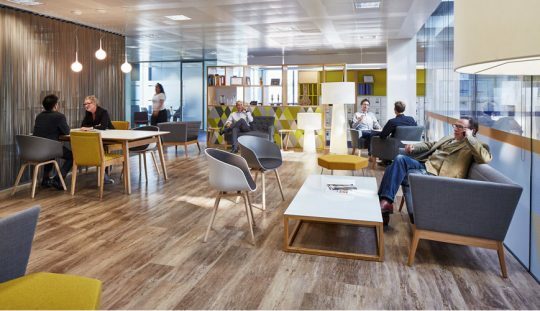 In this article, LOM Director Simon Marett explains why large corporates are adopting coworking and the benefits that this brings to organisations. A common driver for large organisations who are taking space in dedicated coworking offices is to give their staff a more creative, collaborative and potentially more productive environment than their existing workplace can offer. Coworking providers have been quick to adapt to these clients – altering the spaces and changing their offer to accommodate larger corporate project teams and departments. At the same time, some large organisations are applying the principals of coworking to their existing offices. By mixing traditional office with more flexible, coworking style space, they are helping to future-proof their businesses and provide environments that people really want to work in. By creating their own coworking environments, organisations are tapping into a win-win formula. There are strong commercial benefits. A centralised, flexible hub can be ‘home’ to many more people than desk positions provided. This can become a core part of a wider property strategy and help to reduce operating costs. Fundamentally, coworking spaces are designed to facilitate collaboration. For large organisations, it enables the internal businesses, departments and projects teams to interact. By going a step further and inviting business partners, consultants, suppliers and customers into the same environment, there are even more opportunities that the organisation and its staff can take advantage of. Furthermore, in-house events programmes can be developed to make the most of the space and can rival other external coworking offers. Creating a unique environment that promotes interaction and boosts productivity will also help to attract and retain the best people. The added advantage in developing an in-house coworking environment is that it will be tailored to the business’ requirements – reflecting the core values and brand personality – rather than a generic flexible space. This helps to distinguish the business and provide an environment that supports the office culture. Coworking is now a well-established way of working, so it will be interesting to see whether more large corporate organisations will lease dedicated coworking space, or whether they will look to invest in their own buildings and create spaces that are unique to them. 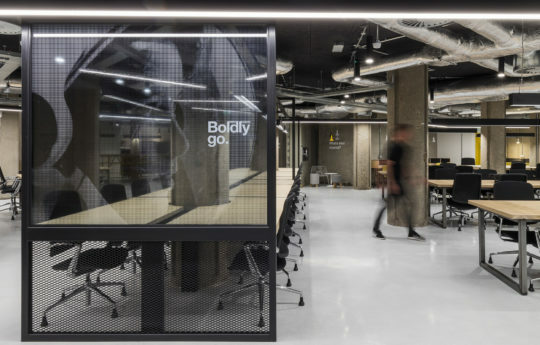 Certainly coworking providers will need to up their game to continue to attract large businesses and this will undoubtedly lead to even more exciting new workplaces in the future. To find out more about coworking and designing flexible office spaces, contact LOM director Simon Marett.